The bustle had first appeared in the late 1860s. It was then part of the 'crinolette', in which excess fabric left over from the once bell-shaped skirts was draped over the hips and bunched up behind. By the 1870s, the bustle had become a separate undergarment in its own right. The new form of bustle was known as a 'tournure' or 'dress-improver', as the word 'bustle' was considered vulgar by Victorian ladies. Bustles were made in a variety of fabrics, including silk, cashmere, flannel, brightly printed cottons and horsehair. They were often trimmed with lace. Some were constructed almost entirely of steel, others resembled colourful cushions. They could be stuffed with horsehair, down and even straw to achieve the desired fullness. The bustle was secured to the body by tapes, which were tied around the waist and hips, over the petticoat, and often under the bottom. These tapes were normally adjustable and could be pulled to achieve a different shape or vary the size of the bustle. Many manufacturers named their bustle designs after popular figures of the time. This bustle is similar to the 'Lillie Langtry', named after the well known actress. The steel wires are attached to a pivot, so they folded in on themselves when the wearer sat down and sprang back when she rose. A novelty bustle made to commemorate Queen Victoria's Golden Jubilee contained a musical box which played 'God Save the Queen' each time the wearer sat down. The bustle first appeared in the late 1860s. It was then part of the 'crinolette', in which excess fabric left over from the once bell-shaped skirts was draped over the hips and bunched up behind. By the 1870s, the bustle had become a separate undergarment in its own right. This bustle was designed to fold up when the wearer sat down. Six curved steel wires are looped at each end around one main straigh axis, which allows them to pivot. 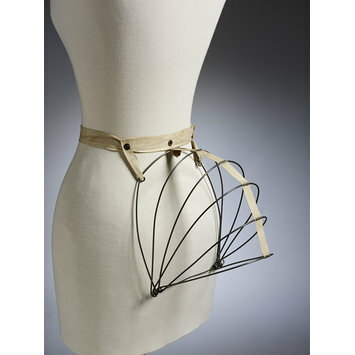 New designs for undergarments were often named and registered. This prevented copying and encouraged customers to buy the latest styles. Brown's "Dermathistic" corset, of 1883, featured leather-faced bones and steels. The company claimed that these made the corset stronger and more durable. 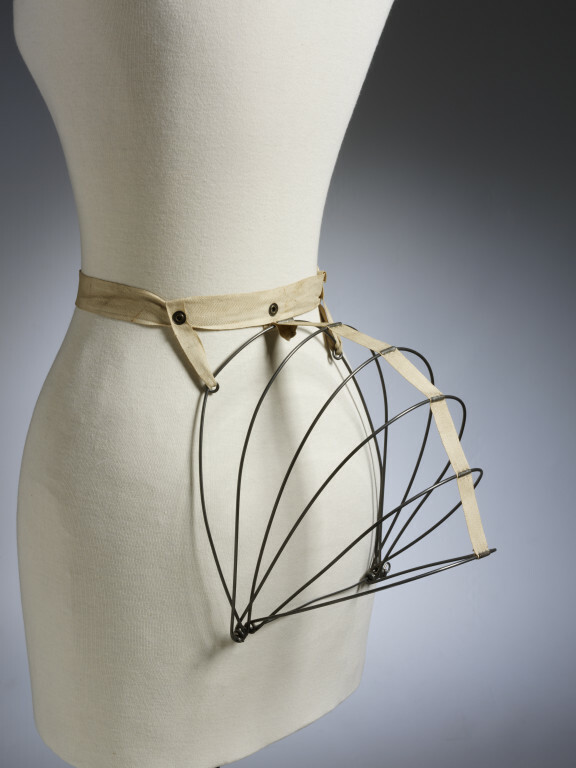 Stapley & Smith's 'New Phantom' collapsible bustle frame was a simplified version of its 'Keelapso' bustle, registered the year before in 1887. The corset and bustle are displayed with combinations, which were widely worn from the mid 1870s. The New Phantom Rebd. No. 72855 Patent Applied for.